Well, maybe it was a little early for lunch, but what the hay, we've earned it. Now let's get ready to head for Hartford. Take a look up there: They're still calling it broken, but from here it sure looks like a solid overcast—not that it really matters, though. It looks like we can expect two thin cloud layers at roughly 2000 and 3000 feet—at least around here. So if we request 6000 feet, we should be in VFR conditions on top for most of the trip. Also, with ceilings of 2000 feet or so, no airport is likely to be close to minimums, so we needn't be concerned about an alternate airport. It's a bit gusty at Hartford right now, but that's probably the front moving through; it might calm down by the time we get there. The main thing is that no thunderstorms have been reported in connection with the frontal movement. We can figure on the same route back—at least as far as Norwich, where we'll head up to Hartford instead of Madison. 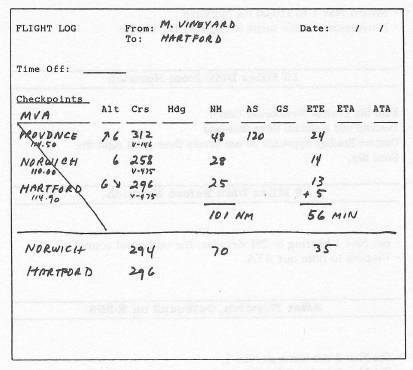 This makes the flight log easy to prepare: Except for the last leg to Hartford, we already have the checkpoints set up, the distances are figured out, and the return headings are just the reciprocals of those we used on the way out. Four Six Foxtrot Ground ready to copy? Such is life! They've given us V-130 all the way—the routing we probably should have requested in the first place. Don't start to taxi until you know which way you want to point the airplane after takeoff. Instead, tell Ground Control, “Ground, Four Six Foxtrot, stand by one,” and pull out your chart. 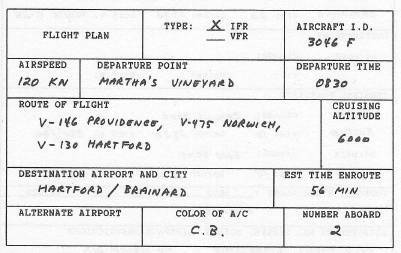 Note that V-130 runs from MVA to Norwich on heading 294 degrees. Set Nav 1 to 108.2 for MVA. Set the Nav 1 bearing to 294 degrees for the Airway. You can figure out the rest of the log later on. Turn right there on the ramp and follow the parallel taxi strip. Four Six Foxtrot Tower on one twenty-one point four. Four Six Foxtrot Vineyard Tower position and hold. Note the time, and take off when ready. After liftoff, turn right to 294 degrees. Contact Otis Approach on one twenty-four point seven good day. Turn to 320 degrees and monitor Nav 1. When the Nav 1 needle centers, proceed on R-294. Note that they've given us 4000, not the 6000 we requested. When you have a chance, work out your revised flight log. Just use Norwich as the first checkpoint. Four Six Foxtrot Westchester Center on one thirteen point niner So long. If you wish, set Nav 2 to 115.6 for Providence. Toggle the Nav 2 OBS to center the needle with the flag reading FROM. From time to time, recenter the Nav 2 needle as a position check. What's our ETA at Norwich? Leave the Nav 1 OBS set to the Airway radial. Switch Nav 1 to 110.00 for Norwich. Set Nav 1 bearing to 296 degrees, the outbound course. Prepare to note our ATA. Set Nav 1 to 114.9 for Hartford. Turn as required to recenter the Nav 1 needle. Reset Nav 2 the same as Nav 1 again, as backup. Expect the VOR-A approach to Brainard. Find the approach plate and begin studying it. At this point, users with ADF equipment can skip the remaining instructions and try the NDB-B approach to Brainard, if desired. Expect VOR-A approach to Brainard. Check Nav 1 and Nav 2 on 114.9 for Hartford. Switch the Nav 1 bearing to 334 degrees, the approach heading. Fly Nav 2 to the VOR. Locate the holding pattern on the approach plate. Start a half-standard-rate right turn to heading 154 degrees. Remain on heading 154 degrees for one minute. Start a half-standard 180-degree right turn to 334 degrees. Intercept R-334 and track inbound. At the VOR, start another 180-degree right turn to 154 degrees. Repeat the pattern until cleared for the approach. Continue in the holding pattern until inbound on R-334. At the VOR, begin a 500 fpm descent on heading 334 degrees. Keep the Nav 1 needle centered. Level off at 1100 feet—unless the airport is in sight at that point. If the airport isn't visible at DME 7.3, you have a missed approach. There's no wind. Pick your runway and land. Four Six Foxtrot Ground on one twenty-one point six so long. You're cleared to taxi to transient parking. The final approach fix (the point at which you begin your descent). A VOR radial that you track upon descent. A minimum altitude to which you may descend unless you have the runway in sight. 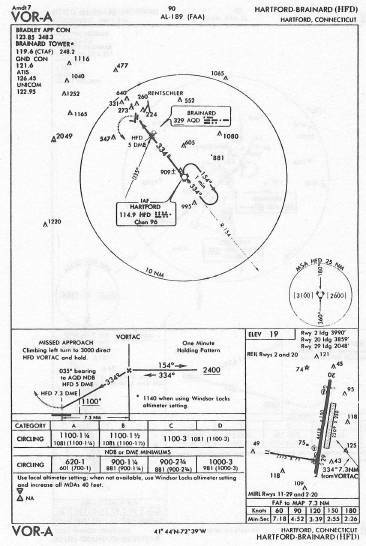 Most VOR approaches guide you down to a specific runway on a heading that's at least approximately lined up with that runway. However, sometimes the VOR location and runway direction make a straight-in approach unfeasible; in such cases, there may be a VOR approach that gets you down to the airport but not to a specific runway. Once you have the airport in sight, you then have to circle to land on one runway or another, depending on the wind. Such an approach is referred to by a letter instead of a runway number, such as a VOR-A or VOR-B Approach. 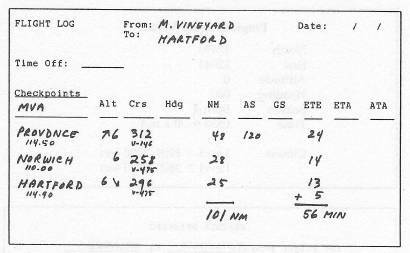 As the approach plate shows, this approach begins at the Hartford VOR. You arrive at the VOR on R-334 at 2400 feet. You begin your descent at station passage, track outbound on R-334 as you descend, and go no lower than 1100 feet until you have visual contact with the airport. A standard 500 fpm descent usually works out just right. As you come in over the airport, you won't be aligned with any particular runway. So when the airport is in sight, consider the direction of the wind and circle to land on the runway of your choice. At various points on aeronautical charts, you see a racetrack-shaped oval identifying a holding pattern. 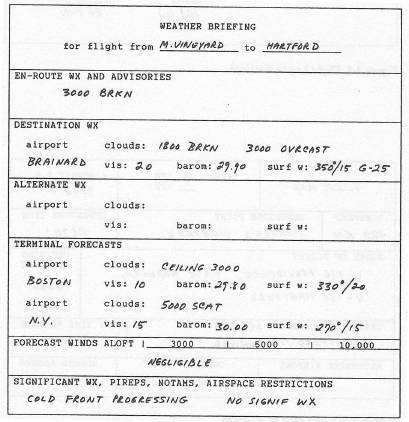 For example, on the plate for the VOR-A approach to Hartford notice such a pattern at the Hartford VOR. IFR flights are often assigned to hold in such a pattern to allow ATC to regulate the flow of traffic. The navigational fix at which you should hold. The VOR radial you're to hold “on” (the radial you'll be on when you're in the oval and inbound to the holding fix). Either right-hand or left-hand turns to make. Hold at the Hartford VOR on Hartford R-334, right-hand turns. Thus, you would fly directly to the VOR and turn right to heading 154 degrees. That would put you on the outside of the oval, heading outbound. You would fly that outbound heading for one minute, make a 180-degree turn to the right to intercept R-334, and track inbound to the VOR. At the VOR, you would again make a 180-degree right turn to the outbound heading of 154 degrees and repeat the process. Then, when traffic permits, ATC would clear you to leave the holding pattern and proceed in accordance with your clearance. On easterly headings (000-180 degrees), use odd thousands of feet (5000, 7000, 9000). On westerly headings (180 to 000), use even thousands of feet (4000, 6000, 8000). VFR flights use the same rules but add 500 feet to the altitude (such as 5500 on an easterly heading or 6500 on a westerly heading). When there's no visible horizon, you must control the aircraft by reference to instruments alone. (Of course, to fly in such conditions, you must be on an IFR clearance.) When you enter clouds, the windshield becomes all gray and your first concern is not to panic. If the airplane is straight and level when you enter the clouds, it will probably stay that way at least for a while. Instrument flying is an art with a number of important ingredients. One is that you must develop complete and total trust in what the instruments tell you. Another is that you must develop a smooth, consistent pattern for scanning all the instruments—keeping your eyes and attention constantly in motion, never allowing your attention to become fixed on any one particular instrument or another. Perhaps the easiest flight instrument to use when you're “socked in” is the artificial horizon. It's very much like having a periscope that pokes up through the clouds, giving you a view of the horizon you can't see through the windshield. Still, you shouldn't depend on it entirely; keep scanning all other instruments as well—airspeed, altitude, heading, RPM, attitude, airspeed, altitude…and so on. A less popular type of instrument approach is one based on a non-directional beacon (NDB) instead of a VOR. NDB approaches, which are also called ADF approaches, require the aircraft to be equipped with ADF. The IBM version of the program is not so equipped, but users of other versions might want to experiment. At Hartford, there's an NDB-B approach. Arrive at the Hartford VOR at 2400 feet and start your descent as you proceed outbound, using the ADF to home on the Brainard NDB. Stay at 1500 feet or above until station passage. At the NDB when the needle drifts around to the bottom of the window, turn left to heading 323 degrees and continue the descent. At many large airports, pilots can tune in a special Com frequency to get a recorded announcement giving the current altimeter setting, wind, visibility, and so on. The ATIS announcements are updated frequently, and each revision is given a code-letter identity, such as Information Kilo or Information Charlie. To save time, pilots are encouraged to get the current ATIS information before they contact the tower and to advise the controller that they have “Information Kilo,” or whichever update is current, so the controller won't need to repeat it. In practice, the ATIS frequency at any given airport is different from the control tower frequency. 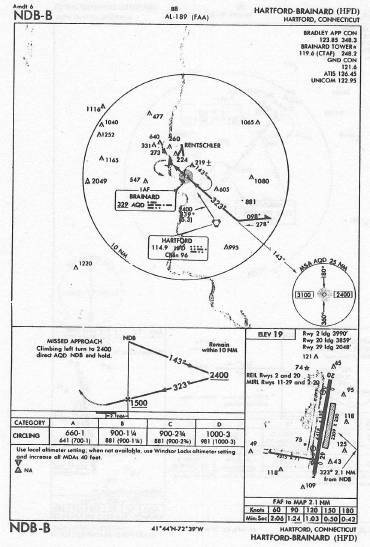 For the program, however, where control tower frequencies are given on program charts, entering that Com frequency usually provides a text display of the current ATIS recording. The message is consistent with any cloud or wind conditions you've set up on the program, and the runway in use will be consistent with the wind direction.